I'm taking a day off from talking about our discussion of The Matrix because I want to recount to you a harrowing tale of large files, downloads and a crazy, video-laden service that almost wasn't. This summer, Upper Room sent 11 teams across the country and across the globe for missional experiences. For four of those teams, we had a community member go along with a video camera to capture the story of the trip. The idea was that each videographer would return from the trip and create a video of that trip. Those videos would be shown on our Missions Sunday--four trip videos and a fifth overview of all the trips. This past Sunday was that night. It all sounded like a good plan. But, as so often happens, the best laid plans are, well, imperfect. Because our community draws from all over the place, it's not always easy to have people just drop stuff off at the church. So all last week, I was using iChat to transfer preview copies of the videos. iChat works great, but when you're dealing with video files ranging in size between 200 MB and 1 Gig, it does take time. After all the suggested changes had been made it was time to get the final videos. Saturday afternoon, the first file came in--200 MB from an editor in California. The overview video was done. Later that night I fired up a 1 Gig transfer from one team member. Shortly thereafter, I launched another 450 MB transfer. I knew I had bandwidth to spare and the limiting factor would be the other two's upload speeds. At Midnight, I went to bed, safe in the knowledge that I had 1 video on my computer, another almost done and the third more than half transferred, and the other two would be arriving on CD at church on Sunday. When I got up at 9:30 (we meet at night, remember), I checked the file transfer. The 1 Gig finished up fine. The 450 (the slower of the two links) failed. Earlier in the week, when we transferred this file, it took over 8 hours. It was now 9:30 AM, and our first service starts at 5 PM. Being quick with math, I knew this could be a problem. I looked over the log and discovered that for some reason the transfer rate of the failed file was much faster this time than last, so there was hope that we could get it here in time. There were a few problems, however. I normally get to church about noon. There was no way I could fire up a transfer at 9:30 and expect it to be done before I had to leave. I couldn't be late as we had a major setup to pull off. And I couldn't start the transfer at home, the sleep my laptop and pick up where we left off when I got to work. And I had just gotten up, so I couldn't even run in early and get it started. What to do? I chose to lean into technology. I shot off a text to the new CPC tech director (who I knew would be near our tech booth) and asked him to fire up the iMac in the booth (CPC still uses the PC). I sent a text to the videographer (who was now back at college) and told her we needed to re-start the transfer. I used a web-service called LogMeIn to remote into my iMac and set up my AIM account in iChat (I had configured the iMac for remote control with LogMeIn before I went on vacation earlier this summer). I logged off AIM on my laptop and logged in on the iMac (via remote control). Once I woke up the videographer (she's a college student after all...), we re-started the transfer. Now I was free to finish getting ready and head in at my normal time. I kept apprised of the progress in real-time using LogMeIn. I also Google-chatted with my creative director to keep him posted of what was happening. Thankfully, the connection was even faster and by 2:20, we had the file on the iMac. The other 2 videos came in on CD, and we loaded all 5 into ProPresenter. Rehearsal went smoothly, and we worked out a few cuing bugs. We had a total of 5 projectors in the sanctuary. 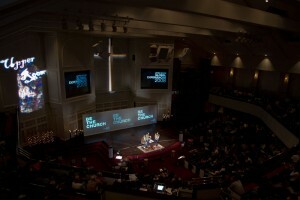 We built a 32'x8' wall on stage and projected the same graphic background 3 times across that. We ran the videos on our two main screens. With my newly remodeled tech booth, I was able to address the stage projectors and the main projectors independently. In the end, it looked great and everything ran very smoothly. While I was busy running around like crazy getting the wall and 3 projectors set up (with full RGBHV signals to each of them), my team dove in and did their jobs well. We hit all our marks and even finished up rehearsal early. The message of the trips was powerful, and it will be exciting to see what God does in our midst over the coming year. Next Sunday we'll be talking about the future of Upper Room, and what we thing God has in store for us. It will be really exciting, and I can't wait to share it with all of you. Tomorrow we'll return to our regularly scheduled series on the Matrix. Thanks for reading.